Live in the heart and soul of False Creek Village here at Vancouver’s EPIC at WEST Condos by Executive Group Development. The first 2 phases are SOLD OUT and Phase 3 (final phase) is launching this Spring 2016. Called EPIC at WEST Vancouver False Creek Village, this boutique high-rise tower will be home to 120 new residences offering contemporary lifestyle designs and located in the most sought after new waterfront community. 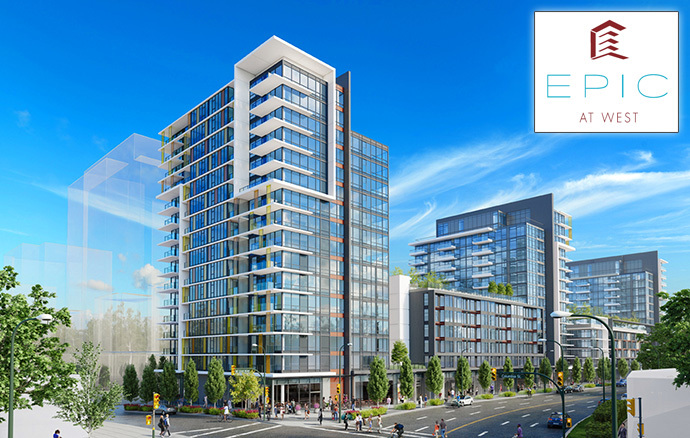 Residents who choose the False Creek Vancouver EPIC at WEST condos will find convenience at their doorstep, anchored by the Village retail centre, seawall, the Telus Science World and of course, downtown Vancouver. 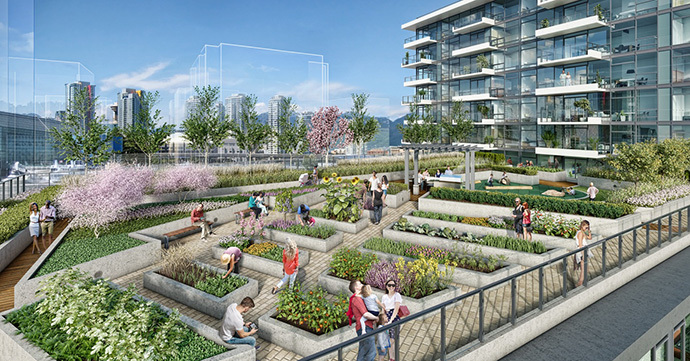 According to their marketing brochure: EPIC at WEST is located in the heart and soul of False Creek Village. 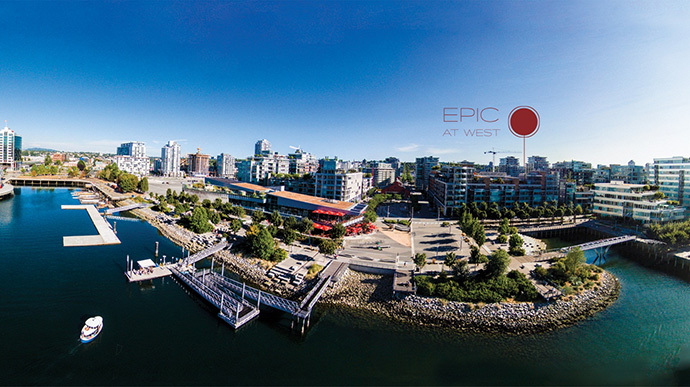 Here at EPIC at WEST, it is about being a part of something grand on a global scale, engaging with your neigbours, savouring the breathtaking scenic beauty of Vancouver, connecting with nature all year round and acting on the endless adventures that await you each and every day, in every direction. The Village is diverse in culture, age, professions, talent and lifestyles. It amplifies modernity, progress in harmony. It is vibrant, dynamic and deserving of the world’s attention as one of the best brand new waterfront communities to live in. EPIC at WEST in False Creek Village Vancouver is the final jewel in Executive Group’s multi-phased development called the Residences at WEST. Changing the face of False Creek forever and spanning an entire city block with 3 towers, Residences at WEST is complete with a 18,000 square foot day care, accompanied by ‘Shops at WEST’ which offers over 43,000 square feet of upscale retail. 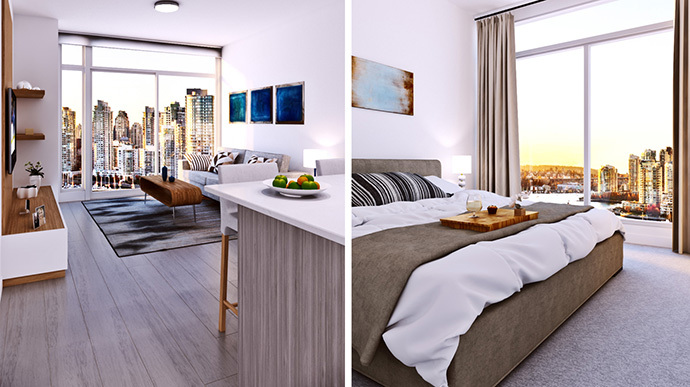 From the bold architectural design to exquisite European inspired interiors and superior construction quality, the new False Creek Vancouver EPIC at WEST condos are launching now! Every day, adding value to your life in limitless ways. The expected completion date is in late Summer/Fall 2017. The project will feature junior one bedroom, 1 +den, 2 and 3 bedroom floor plans. Visit www.epicatwest.com for all the details or register on this page. The interiors at Vancouver EPIC AT WEST offer a high level of sophistication and design. Celebrated local designer, Caroline Boisvert from Atmosphere Interiors draws her inspiration firstly by understanding the daily needs of the home owner and then designs the interiors so they stand the test of time, from a functional and esthetic perspective. Every inch is thoughtfully optimized for functionality, comfort and luxury. 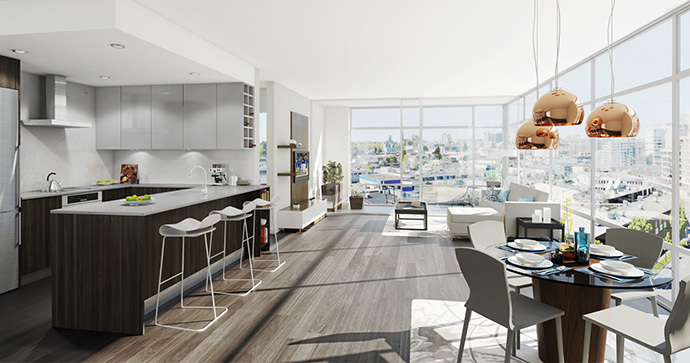 Each home at EPIC at WEST Vancouver False Creek condos offer the home owner a place to live, work, entertain and relax. An immediate sense of openness, flow and natural light are intrinsic elements in every home. The materials are chosen based on how they contribute to a healthy sustainable living environment – a harmony balanced by warm tones, natural materials and longevity. Contemporary interiors include two colour schemes (polished or radiant) and German TORLYS smart laminate wide plank floors with sound attenuating underlay, floor to ceiling window walls for light and views as well as a single panel solid core entry door. Other False Creek Vancouver EPIC at WEST condo features include controlled hotwater baseboards throughout, full height sliding glass dividers in dens and frosted sliding glass dividers in junior one bedrooms in addition to stacked Blomberg front loading washer and dryer. The elegant bathrooms at the presale Vancouver condos at EPIC at WEST False Creek living include imported quartz (carrara marble inspired) counters, wood veneer vanity with under mounted basin (dual vanity in selected suites) and contemporary metal edge pulls. Also, there are radiant and luxurious illuminated bathroom mirrors, grohe polished chrome faucet, imported large format matte porcelain floor tile and vanity feature wall, deep profile soker tub with polished fixtures and rain shower head and bathtub/shower surround tiles with shelving niche finished in quartz. The bathrooms will also have Kohler eco-friendly low flow and high-efficiency toilets and frameless sliding glass walk in shower and custom medicine cabinetry. The open and modern gourmet kitchens at the preconstruction Vancouver False Creek condos at the EPIC at WEST condo building will feature imported quartz counters and backplashes, contemporary high gloss acrylic upper cabinetry and wood veneer lower cabinetry, soft close drawer mechanisms and built in wine cabinetry for selected suites. Other kitchen features include under mount stainless steel sink, European Collection Blomberg fridge with bottom mount freezer and dishwasher, Italian Fulgor shallow profile induction cook top and builtin convection oven as well as a Panasonic microwave with trim kit. Straight from their marketing brochure: EPIC AT WEST is located within Vancouver’s best seaside excitement having the most breathtaking natural scenery of the majestic North shore mountains and the soothing ocean’s water. Honorable mention includes being steps away from the largest outdoor seaside patios in Vancouver, the Food Truck Fest, International Dragon Boat Festival and seconds away from the very BEST of what Vancouver has to offer. The Village’s very own 1.1km seawall is the brand new link to Vancouver’s 22 km of continuous seaside pedestrian-bicycle route. At EPIC AT WEST, healthy living is readily available and easily accessible offering you, from the most leisure to the most active of lifestlyes – you decide. Oh, and you want to go to the hockey game, or have tickets to a concert or take a friend to the Whitecaps game? No problem, Vancouver’s Roger’s Arena and BC Place is a walkable distance away! At EPIC AT WEST, public amenities are abundant and at your doorstep – from Executive Group Development’s very own 43,000 sqft of upscale street level retail called “Shops at West” covering an entire city block including the spectacular 18,000 sqft daycare facility in Phase I, to the Village’s very own Urban Fare groceries, London Drugs, Creekside Community Centre, Liberty Wine Store, Craft Restaurant, Tap & Barrel, Terra Breads, JJ Bean, school sites, parks, marinas, and all your day-to-day services for postal, banking, drycleaning & pets – it’s no wonder this is its own city within a city and Vancouverites are choosing to live here! The public transportation is the most comprehensive yet to be seen for a neighborhood – within a 4 block radius includes the Canada Line, Skytrain, water taxis, #84 UBC bus, streetcar, 22 km of seaside bike.